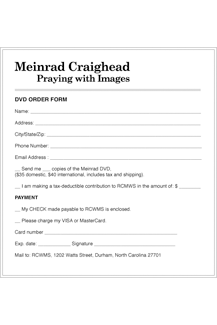 Order a DVD of Meinrad Craighead: Praying with Images, the hour-long documentary. To order the DVD through the mail. Download the pdf form at the right and mail with your check (or credit card information) to RCWMS, 1202 Watts Street, Durham, North Carolina 27701.